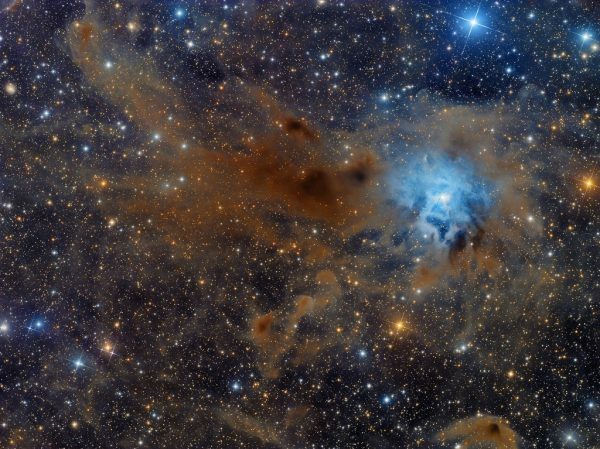 The clouds of dust, gases, gravity, create curious and fun ways as the Iris Nebula, so called … well not insist much. NGC 7023 or Iris Nebula is a young area, full of gas known as a breeding ground for stars. It is so named because the gas density and gravity causes and make it “born” many stars in the very near future (thousands of years, gravity is somewhat slow). At about 1500 light years away and only 6 light-years across the light reflected from its center is one of the more light that can be seen in the northern hemisphere. Illuminated by a star of “amount of light” as the Big Dipper or type 7, the brightness of the stars is cataloged by the ODS standard (or catalog ODS) which contains about 260 000 stars for its bands of light (remember that a star, emits radiation in several lengths that allow us to know that this made) what made him one of the best of his time and which is still in force. Next to catalog Draper, created, they say by Henry Draper but that really worked the best women (who do not recognize anything) scientific (if, for me it were) of Harvard College Observatory and compiled and classify stars by their magnitude.